The fine engineering of our upper spine offers many benefits, yet until we require neck treatment the freedom and mobility it provides is easily taken for granted. Perhaps we would have a better appreciation for what’s between our head and shoulders if we were built more like a giraffe. Take a minute then to appreciate how wonderful our necks really are. How special is your neck? The neck is a complex and sensitive structure or nerves, muscles, ligaments, tendons and bones. Our heads make up about seven percent of our body weight, yet are finely balanced on seven vertebrae. These bones make up the cervical spine, more commonly known as your neck, and are much more mobile than the two other segments of the spine, allowing us to move our heads in a range of directions and angles. Like the rest of the spine, this section houses the spinal cord, a delicate bundle of nerve fibres, crucial to the central nervous system, and responsible for sending messages from the brain to control all aspects of the body. So although flexible, the neck can be prone to a variety of injuries, because of the weight it supports and the complexity of its structure. If you need more incentive to take care of this musculoskeletal marvel, keep in mind the neck’s other critical functions, such as the protection of arteries that carry blood to the brain. Having a better understanding of a neck’s purpose and structure, makes is easier to appreciate the vulnerability of the neck and the variety of ways in which it can be damaged. Neck injuries range from mild to severe and may originate from an accident or through a more long term condition. Whatever the prognosis, it is worth keeping in mind that as the different elements of bones, joints, nerves and soft tissue in the neck work together, damage to one part of the neck can in turn affect other areas, requiring further neck treatment. Muscles from the neck and shoulder blades that are connected to the cervical spine can cause pain if they are fatigued, knotted or in spasm. The muscles can become tired for example if they are protecting injured neck joints. This can lead to muscle weakness, so it is important to restore this imbalance to avoid further related problems. 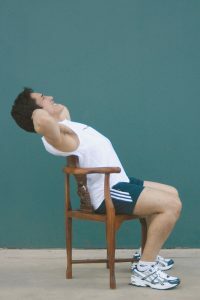 As neck muscle strains can be caused by lifting, neck joint sprains can be the result of a sudden twist of the neck such on waking or from simply turning the head after looking at a computer monitor. This sudden onset of neck pain is often observed after these periods of poor posture, heavy lifting or excessive loading of the neck. In this instance the many small joints of the neck become irritated, inflamed and even jammed as such can be likened to a sprain. The muscles of the neck spasm as your body tries to protect the sprained joint and all of this results in substantial pain and decreased movement, where even the simplest tasks become difficult. Sometimes described as a “wry” or “cricked” neck, its medical term is known as Torticollis. In contrast, whiplash is the result of an even stronger and more sudden head movement, by an acceleration or deceleration force. Most common in vehicle accidents where the occupant is hit from behind, it is a common condition and although painful, treatment is effective as long as it is identified quickly and neck treatment commences soon after the injury occurs. There are also a variety of other more serious conditions such as herniated disc, nerve and spinal cord injury, as well as neck fractures and dislocation. Some of these will require medication and physiotherapy, but more severe cases may require surgery. Nearly half of the world population suffer from headaches, and 15 to 20 percent of these are cervicogenic headaches that originate from the neck and typically occur due to damage to one or more joints. This type of headache may be the result of joints within the neck that become too stiff, too loose or have locked up into an abnormal position. Migraine and tension-type headaches can also be the result of neck pain. To determine the specific cause of these headaches, a comprehensive assessment can be performed to determine if the neck is the problem or if the headache is a symptom of a more serious condition. What can I do for neck treatment? For minor neck pain, like a “wry” neck, moving may be the last thing you feel like doing, yet small amounts of movement in your available range, (where the pain is the least) will bring about a quicker return to normal function. Heat in the form of wheat bags, hot water bottles or a hot shower will help decrease muscle spasm and make you more comfortable. It is a good idea to try and move small amounts whilst heat is applied. Apply your heat pack for twenty minutes at a time, making sure you experience a warm comfortable heat only, to avoid burns. Wry necks which are caused by joint dysfunction typically resolve in 3-5 days; however discogenic wry necks will often take several weeks to improve. In both cases, physiotherapy treatment will bring about resolution of symptoms much quicker. For other conditions that are more severe or prolonged please consult a professional for advice and neck treatment that may include anti inflammatory medication or further investigation with the use of x-rays, an MRI or specialist advice. Below are some simple neck exercises that can be performed easily if your neck starts to feel stiff or as part of a regular preventative neck pain exercise routine. If you experience any discomfort or pain during these exercises, please stop immediately and consult a physiotherapist for them to assess whether these are applicable for your neck treatment. If I have neck pain what should I avoid? If you cannot move your head you should avoid driving, so it is best to get a lift or public transport when out and about, especially since you wouldn’t want to undo the good work of your Physiotherapist. Heavy lifting, poor posture and other activities that increase load on the neck should be avoided. What will my Physiotherapist do? Your physiotherapist will assess you and provide specific treatment for your particular presentation. This may include massage, mobilisation (moving joints),dry needling and other techniques to facilitate the moving of joints and relaxation of muscles. As part of your neck treatment they will also give you specific exercises to restore movement and help you achieve good posture. You may also need strengthening exercises to help prevent the recurrence of pain and a neck brace may be required for some neck conditions. Depending on the injury neck pain can last as little as a few days and often full movement can be restored in this time. However if the injury is more severe it may take two to three weeks, in which case your physiotherapist will offer further neck treatment, advice and management to minimise the injury duration and make sure you return to normal function as soon as possible. Posture plays a big role in the prevention of neck pain. Knowing what constitutes a good posture is one thing, but ensuring you put this information into practice will require some degrees of self awareness. So throughout daily activity, such as using your phone, sitting at the computer or relaxing after work on the couch, it is important to ensure that the muscles, tendons, and joints that support your neck have adequate support, and good posture is a great place to start. 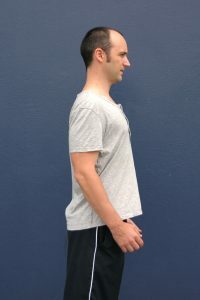 Practicing good posture each day is one way to stay ahead of neck pain. 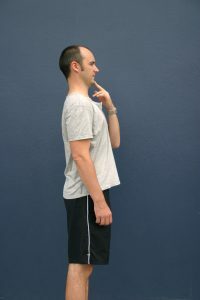 Ideally you should keep your head and shoulders aligned, and so avoid slumping forward while standing, hanging your head down, or shifting your neck to one side or the other. This will reduce the chances of neck and upper back stiffness and the longer term consequences of weak, tight or imbalanced muscles. Having an ergonomic workplace, with items such as benches and computer monitors at an appropriate height, will set you up for success. Being mindful during the day can be complimented by assessing your sleeping setup and posture at night. Having a pillow that is neither too high nor too stiff is a good start as it will prevent your neck from being flexed overnight. Try using a feather or memory foam pillow that easily conforms to the shape of your neck. Sleeping on your back is best for your neck, but if you plan to sleep on your side, be sure to keep your spine straight by using a pillow that supports your neck, that being a pillow that is higher under your neck than your head. Sleeping on your stomach is tough on your spine in general and having your head turned to one side will increase the chance of neck pain. If sleeping on your stomach is your preferred position, at least try alternating positions throughout the night and avoid using a pillow. Having a good night sleep will also aid any efforts you make during the day, by helping to assist in the healing and relaxation of your neck. Pillows can also help your neck if you are travelling, as neck and back pain can be an unfortunate consequence of those sedentary hours spent in transit. Whether it is the development of new aches and pains or aggravating an existing condition, none of these are welcome once you reach your destination. You don’t necessarily have to sit upright all the time, but instead trying to straighten up regularly will take a small amount of load off your spine. If sitting for a prolonged period of time whilst driving or flying, roll up a small towel into a cyclinder shape and place it in the small of your lower back. If you have the right curve in your lumbar spine, it will be much easier to maintain the correct posture of your neck as well. Finally your neck, and the rest of you will benefit from an active lifestyle that avoids excessive slouching or bending activities. Staying well hydrated regardless of the amount of exercise is also important as this will lessen the chances of muscles, tendons and ligaments becoming tight. Exercise also has the bonus of burning off any stress you may have accumulated, so trying something gentle and rhythmic like swimming, walking or cycling can act like a meditation in motion. Overall, increasing your quality of health by losing weight, quitting smoking and reducing stress through a good diet and exercise will compliment your efforts to look after your neck – handy for when you are next at the zoo, gazing upwards, marvelling at that giraffe. If you experience cervical spine pain and it lasts for more than a couple of days, or materialises suddenly or sharply, it is best to see your doctor or physiotherapist for professional neck treatment advice as soon as possible.